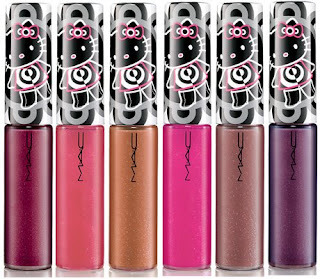 2.MAC Hello Kitty Dazzleglass in Dazzleglass , Kitty Kouture. 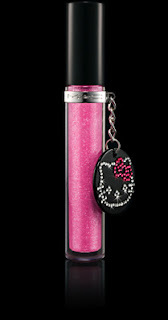 Exclusively for the Hello Kitty Kouture collection: a traditional Dazzleglass vial with silver chain pendant featuring Hello Kitty outlined in white Swarovski crystals on black with a pink crystal bow. 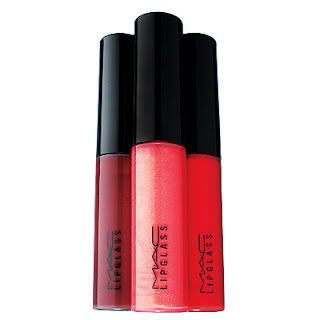 This pigment-drenched gloss is available in a variety of dramatic shades—from pale, silvery pinks to wickedly intense plums. Pros also praise the sponge tip, which ensures a quick, even application. 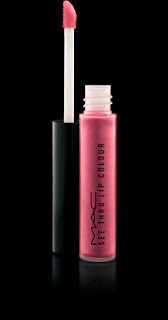 4.MAC See Thru Lip Color in Loving Touch , Secret Crush , Tender Tryst. 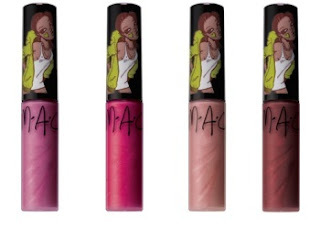 Sold out to all Mac Store!